“Flesh” was one of the half-dozen or so stories that appeared each week in those early months of 2000 AD. It was the story of how cowboys of the future travelled back to the Mesozoic to harvest dinosaurs for their meat, and was the subject of Jeff Liston’s chapter in the recentish Geological Society volume on the history of dinosaur research. Compsognathus made another pop-culture appearance in The Lost World: Jurassic Park, of course, as the cute little “compys” that tear one of the nastier human characters to pieces. 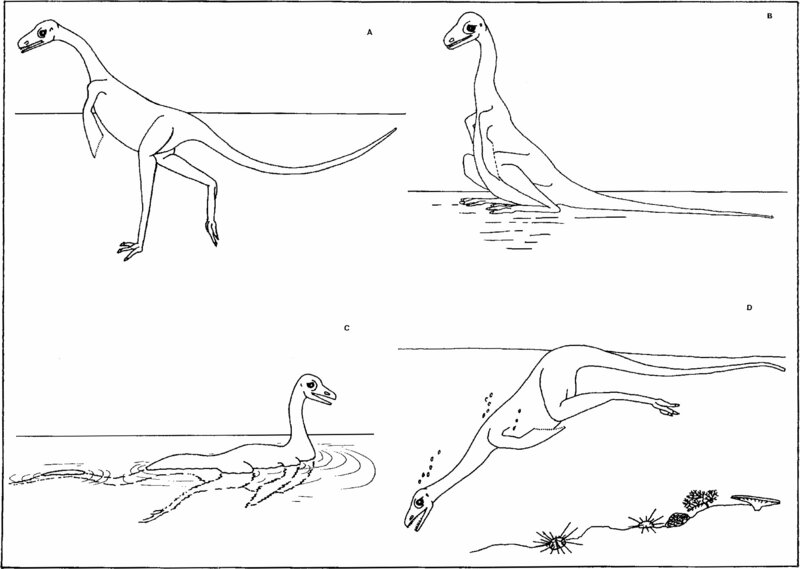 John Ostrom’s (1978) Compsognathus monograph showed that this was nonsense, but of course that was too late for the early issues of 2000 AD. Bidar, A.; Demay L., Thomel G. 1972. Compsognathus corallestris, une nouvelle espèce de dinosaurien théropode du Portlandien de Canjuers (Sud-Est de la France). Annales du Muséum d’Histoire Naturelle de Nice 1:9–40. Halstead L.B. 1975. The evolution and ecology of the dinosaurs. Eurobook. ISBN 0-85654-018-8. Ostrom, J.H. 1978. 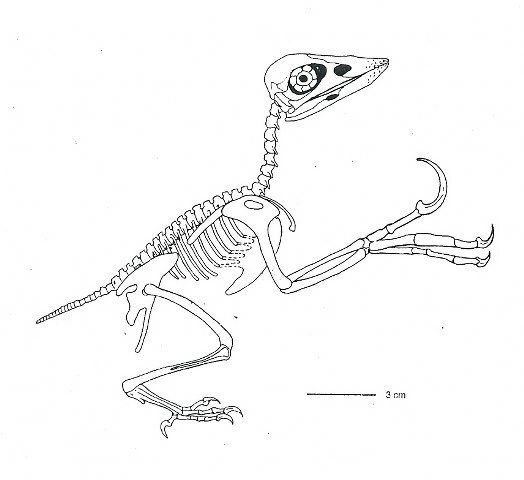 The osteology of Compsognathus longipes. Zitteliana 4:73–118. 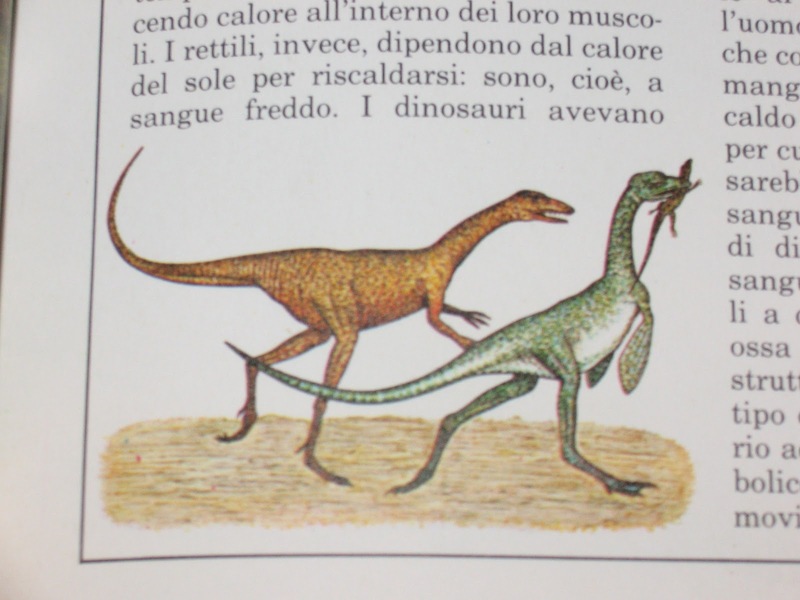 … and one from David Norman’s Illustrated Encyclopedia of Dinosaurs. 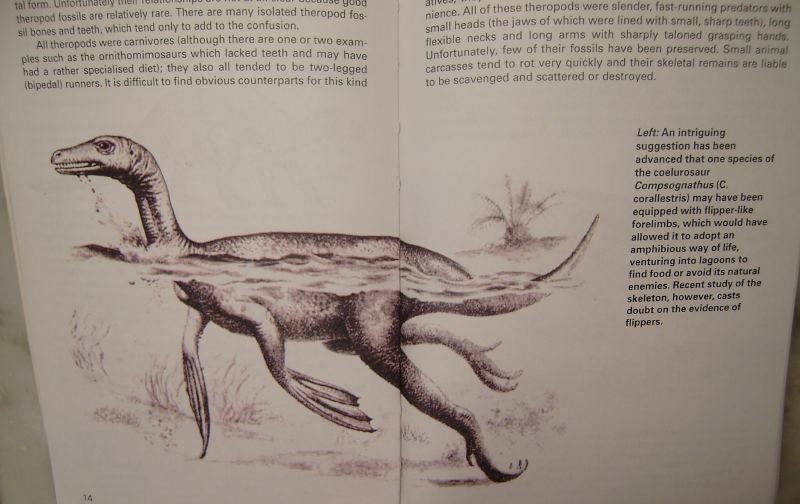 John Sibbick also illustrated a fin-handed paddling compy for David Norman’s Illustrated Encyclopedia of Dinosaurs, BUT I am pretty sure that Norman was clear that the idea was bunk. I knew you couldn’t resist the obvious superiority of theropods forever. TA-POW, here we come! TA-POW!? Never. But you can chalk this one up to TSM-POD (that’s Theropod Stupid Manus Picture Of the Decade). Ah well, I’ll look forward to your article on this atrocity (http://www.birdwatching.pl/userfiles/image/Ptaki%20Konfucjusza/szkielet%20confuciusornis_524x480.jpg) in 2021 then. IIRC the mention of C. corallestris‘ possible finnedness in Norman’s Illustrated Encyclopedia of Dinosaurs was just that – a mention, with him ending by saying that more recent studies indicated that it prob wasn’t the case. It was a black and white pic on one of the “text” pages rather than one of the full-colour double-page spread di(n)oramas. Thanks, Andrea. I’ll update the post to point to yours. We have quite the little gallery now! It should be noted that not only did Bidar make the argument, it is based on features of the mainslab which both he and Ostrom examined, and which Bidar illustrated in a reconstruction. The “fish-handed” idea is a development from Bidar’s original thesis, which was that the hand was embedded in a mosasaur-like “mitt” or “flipper.” The fish-fin is drawn more specifically from the idea of the structures discussed by Bidar as “rays,” when in fact Bidar assumed they were non-bony (I think; my copy of the paper was a hard one, and I no longer possess it). The ‘flippered Compsognathus‘ paper is Bidar, Demay and Thomel (not just Bidar), and it does indeed include no less than four life reconstructions of flippered compsognathids (in addition to a skeletal reconstruction as well). There are several additional flippered compsognathid reconstructions elsewhere in the popular literature. Following Caselli’s lead, they are often greenish or bluish. I should of course have posted Bidar et al.’s own attempted life restoration. Post now updated to include this! The Bidar reconstruction and most that copy it look like the elbow is bending the wrong way (or the manus attaches directly to the humerus). Why would they draw it like that? At least Sibbick’s looks slightly more like a theropod forelimb. 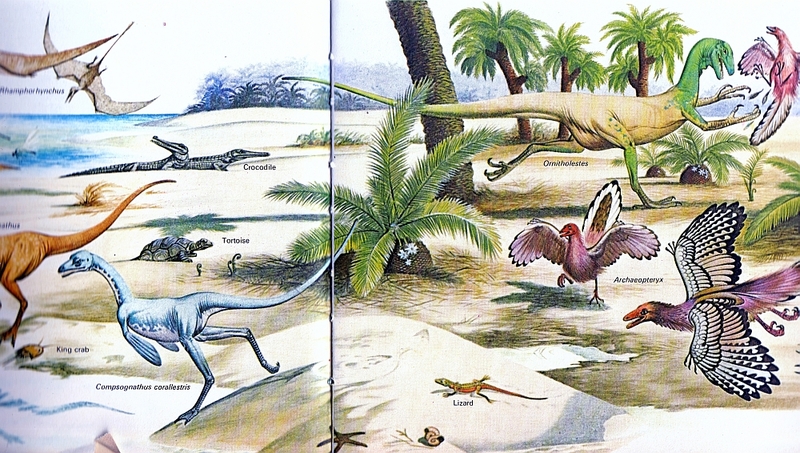 Minor correction, but the “compys” of Crichton’s The Lost World were Procompsognathus triassicus. Apparently they hybridized with piranhas like those Anurognathus from Primeval. Very interesting — tuns out Matthew is right that in Crichton’s novels, the “compys” are Procompsognathus; but in the film, as noted above, they have been promoted to Compsognathus. Never noticed that before. That I recall, the paleontologist in the film, “Robert Burke” (the not-so-subtle Robert Bakker who gets eaten by the T. rex), calls them Procompsognathus triassicus in one of the scenes in the film (same scene where the jerk character zaps the “compy” with a stun gun, therefore guaranteeing his karmic death at their hands, er teeth).